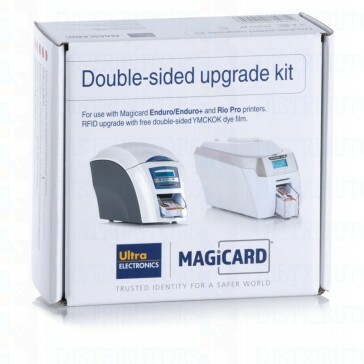 Magicard Single-Sided to Double-Sided Upgrade kit. Includes electronic double-sided upgraded and 1 YMCKOK ribbon. Magicard 3633-0052 Single-Sided to Double-Sided Upgrade kit. Upgrades Magicard Enduro and RioPro Single-Sided Card Printers to Double-Sided Card Printers. Put in ribbon and you now have converted either your Magicard RIO PRO SINGLE SIDE or the ENDURO + SINGLE SIDE printers and they convert right in the field to dual. Easy to use and install gets 250 Prints.